This is a simple picture book but with layers. The illustrations are watercolor like and quite nice. Each spread has a simple statement, more advanced info and a scripture. The very youngest would like the pictures while an older child would like the picture and the more in-depth information available. I can see myself curled up on a child's bed reading to them and then later, them reading to me. This book has that kind of growth potential. I would purchase this in print format but that's just a personal preference. 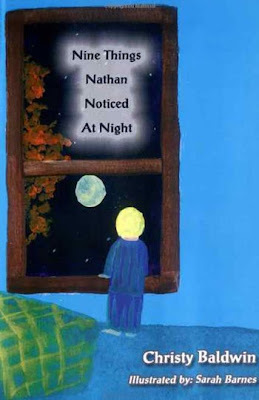 Nine Things Nathan Notice at Night discusses nine great things that happen when the sun sets for the evening. Each page includes a statement about what is happening and then some fun facts and information about the event. Written from a Christian perspective, the story describes how God made things when He created the Earth.